The very first streetcar in the forthcoming QLINE rail system arrived in Detroit late Wednesday, roughly a month ahead of schedule, the first of six such cars that will service the Woodward Avenue corridor beginning in early 2017. The QLINE will stretch 3.3 miles from West Grand Blvd to Congress Ave in Downtown. In an interview with QLINE communications officer Dan Lijana, Thrillist received more details about the streetcars. 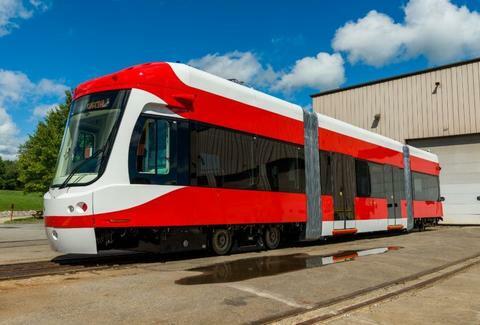 While the QLINE car’s sooner-than-expected arrival date doesn’t guarantee that service will also begin ahead of schedule, Lijana was able to provide a preview of the streetcar’s specifications and amenities. The railcars will hold 125 people, said Lijana, though up to 200 might be able to fit, albeit with “a bit less personal space,” and not including the driver. The cars will feature free Wi-Fi, hanging bike racks, heating and cooling systems, and easy step-on step-off access that is ADA-compliant. Lijana shared that the cars, which are battery-powered, “will operate off the wire more than any other system in the country." For 60% of the car’s trip, the mechanical arm connecting the streetcar to the wire system overhead will retract, and the cars will operate off lithium-ion battery power. In November, voters in Macomb, Oakland, Wayne, and Washtenaw Counties will decide whether to approve a $4.2 billion plan to improve and expand public transit services in the metro Detroit area in a variety of ways, including the addition of rapid bus transit, expanded bus services, and a commuter rail system between Detroit and Ann Arbor, among other amenities. In March of this year, the M-1 Rail Project was renamed QLINE after billionaire investor Dan Gilbert and his Quicken Loans company donated $10 million to the $140 million project. Little Caesars Arena, the new stadium being built for the Detroit Red Wings, will be serviced by the QLINE’s Sibley Station stop. Lijana said that as soon as the car arrives, it will begin testing and training on the track... so we’re telling you there’s a chance for this to be up and running sooner than we thought. At the very least, you might see it jangle by next time you’re hitting up Wright & Co for brunch. Bryan Kelly is a Michigan native and public transit enthusiast who teared up when he heard the QLINE car would have hanging bike racks. Follow him on Instagram at @kellysbikerepair.